Wantugu (N/R), Dec 4, GNA - The Northern Region recorded 79 maternal deaths in the past two years and 49 deaths during the first half of this year at its various health facilities. Most of the dead aged between 15 and 49 years. These figures however. do not represent the real situation, as a good number of the deaths, especially in the rural areas, were either not reported or did not occur in the hospitals. Dr Akwasi Twumasi, Acting Northern Regional Director of the Ghana Health Service disclosed this at the regional launch of the "Safe Motherhood Week" at Wantugu in the Tolon/Kumbugu District on Friday. The Week, which was organised by the Regional Health Directorate, has as its Theme: "Death in pregnancy and child birth is preventable - Act now". Dr Twumasi said most of the causes of these deaths could be prevented if help was sort early, adding: "This calls for the collaboration among the patient, the immediate family, the community and health workers". He said the maternal mobility ratio (MMR) of the country stands at 214 deaths per 100,000 live births. As part of efforts to reduce these deaths, he said the Ministry of Health was equipping its midwives with improved midwifery service delivery and clinical skills training in safe motherhood. Dr. Twumasi said the Directorate was making efforts to improve the telecommunication network within the districts in the region to facilitate the transfer of referred cases to higher centres for appropriate management. Additionally, he said, the United Nations Population Fund (UNFPA) and United Nations Children's Fund (UNICEF) were also assisting in the provision of ambulances designed to reach inaccessible areas in the region. Mr Ernest Debrah, Northern Regional Minister, in a speech read for hi, said the 2003 Ghana Demographic Health Survey indicated an improvement in the utilisation of antenatal services over the last fifteen years. He said, for instance, that the number of mothers receiving care for their most recent births had increased considerably, while the percentage of women receiving antenatal care from trained health professionals had increased by 21 per cent. Mr Debrah expressed concern about infant mortality rate in the region, which he noted, was at the rate of 154 per 1,000 live births. He therefore, called for an effective planning system that would take into account the role of Traditional Birth Attendants and Private Maternity Units in health care delivery. Mr Alhassan Baako. 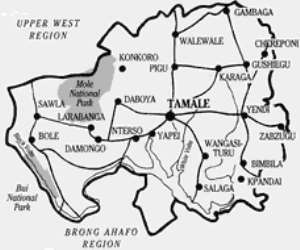 Tolon/Kumbugu District Chief Executive expressed concern about the migration of young girls from the area to the cities to engage in menial work, such as "Kayayee". He said the migration had exposed the girls to sexually transmitted diseases, including HIV/AIDS.